The Hollywood Pantages, a Nederlander Theatre, is proud to announce the Broadway musical, HAMILTON - with book, music and lyrics by Lin-Manuel Miranda - will play its premiere Los Angeles engagement next summer and anchor the 2016-2017 season. Los Angeles audiences will be treated to the direct-from-Broadway premieres of two recent Tony Award-winners for Best Musical Revival: HEDWIG AND THE ANGRY INCH and the Lincoln Center production of Rodgers & Hammerstein's THE KING AND I. The 2016-2017 Season will also include the Tony Award-winning AN AMERICAN IN PARIS, direct from the West End - THE BODYGUARD starring GRAMMY nominee Deborah Cox and FINDING NEVERLAND, based on the Academy-Award winning Miramax motion picture by the same name. Back by popular demand after record breaking & sold out engagements in 2012 and 2014, THE BOOK OF MORMON returns to L.A. for a 6-week limited engagement at Hollywood Pantages Theatre. General Manager Martin Wiviott states, "The exceptional shows we have in store for next season...is the type of lineup that reminds us all why we LOVE theatre. We come together as a community of arts lovers, certainly for the amazing entertainment...but largely because we know that we are witnessing something important unfolding right before our eyes - stories reminding us all about who we are, the important journeys in our lives...and all the important moments in between. Featuring stories from classic music-makers like Rodgers & Hammerstein and George & Ira Gershwin...to today's theatrical trailblazers, such as Lin-Manuel Miranda, director Diane Paulus & John Cameron Mitchell...we are pleased to invite you to join us when the lights go down and the curtain goes up on a memorable and momentous theatrical journey." The L.A. Premiere of the 2014 Tony Award winning Best Musical Revival HEDWIG AND THE ANGRY INCH will celebrate a four-week engagement at the Hollywood Pantages Theatre, November 1 - 27, 2016. Brilliantly innovative, heartbreaking, and wickedly funny, HEDWIG AND THE ANGRY INCH is the landmark American musical by John Cameron Mitchell and Stephen Trask that is "groundbreaking and undoubtedly ahead of its time" (Entertainment Weekly). This genre-bending, fourth-wall-smashing musical sensation, with a pulsing score and electrifying performances, tells the story of one of the most unique characters to ever hit the stage. Directed by Tony Award winner Michael Mayer (Spring Awakening) and winner of four 2014 Tony Awards, HEDWIG AND THE ANGRY INCH played to record-breaking sell-out crowds on Broadway and promises to take the Hollywood Pantages by storm with what Time Magazine proclaims is "the most exciting rock score written for the theatre since, oh, ever!" Ambassador Theatre Group and NETworks Presentations LLC announce that the national tour of the Lincoln Center Theatre production of Rodgers & Hammerstein's THE KING AND I, will make its L.A. Premiere at the Hollywood Pantages Theatre for a six week holiday engagement, December 13, 2016 - January 21, 2017. THE KING AND I directed by Tony Award Winner Bartlett Sher won four 2015 Tony Awards including Best Revival of a Musical. The production is currently playing an open-ended Broadway run at the Vivian Beaumont Theater (150 West 65 Street). One of Rodgers & Hammerstein's finest works, THE KING AND I boasts a score which features such beloved classics as Getting To Know You, Hello Young Lovers, Shall We Dance, I Have Dreamed, and Something Wonderful. Set in 1860's Bangkok, the musical tells the story of the unconventional and tempestuous relationship that develops between the King of Siam and Anna Leonowens, a British schoolteacher, whom the modernist King, in an imperialistic world, brings to Siam to teach his many wives and children. The enchanting new Broadway musical tale of how Peter became Pan, FINDING NEVERLAND, will make its L.A. Premiere at the Hollywood Pantages Theatre for a three week engagement, February 21 - March 12, 2017. Based on the Academy Award winning Miramax motion picture by the same name, FINDING NEVERLAND follows playwright J.M. Barrie as he summons the courage to become the writer - and the man - he yearns to be. Barrie finds the inspiration he's been missing when he meets the beautiful widow Sylvia and her four young sons: Jack, George, Michael and Peter. Delighted by the boys' hilarious escapades, Barrie conjures the magical world of Neverland and writes a play unlike any the high-society London theatergoers have ever seen. It's a tremendous risk, but as Barrie himself has discovered- when you believe, you can fly. AN AMERICAN IN PARIS, the most awarded new musical of 2015 and winner of four Tony Awards, will make its L.A. Premiere at the Hollywood Pantages Theatre for a three week engagement, March 22 - April 9, 2017. Inspired by the Academy-Award winning film, AN AMERICAN IN PARIS is the romantic story about an American soldier, a mysterious French girl and an indomitable European city, each yearning for a new beginning in the aftermath of war. AN AMERICAN IN PARIS brings this classic tale to the stage for the first time with music and lyrics by George and Ira Gershwin, a book by Craig Lucas and direction and Tony-winning choreography by Christopher Wheeldon. AN AMERICAN IN PARIS won four 2015 Tony Awards. The hit musical has also won four Drama Desk Awards and four Outer Critics Circle Awards including Best Musical, the Drama League Award for Best Musical, three Fred and Adele Astaire Awards and two Theatre World Awards. The score of AN AMERICAN IN PARIS includes the songs "I Got Rhythm," "Liza," "'S Wonderful," "But Not For Me," "I'll Build a Stairway to Paradise," and orchestral music including "Concerto in F," "Second Prelude," "Second Rhapsody/Cuban Overture" and "An American In Paris." The North American tour of the hit musical, THE BODYGUARD, will make its L.A. premiere at the Hollywood Pantages with a three week engagement, May 2 - 21, 2017. GRAMMY Award-nominated and multi-platinum R&B/pop recording artist and film/TV actress Deborah Cox will star as Rachel Marron. Based on Lawrence Kasdan's 1992 Oscar-nominated Warner Bros. film starring Whitney Houston and Kevin Costner, and adapted by Academy Award winner Alexander Dinelaris (Birdman), THE BODYGUARD had its world premiere on December 5, 2012 at London's Adelphi Theatre. THE BODYGUARD was nominated for four Laurence Olivier Awards, including Best New Musical and Best Set Design, and won Best New Musical at the Whatsonstage Awards. The musical concluded its smash hit West End run on August 29, 2014 and is currently touring the UK and Ireland. Former Secret Service agent turned bodyguard, Frank Farmer, is hired to protect superstar Rachel Marron from an unknown stalker. Each expects to be in charge; what they don't expect is to fall in love. A romantic thriller,THE BODYGUARD features a host of irresistible classics including "Queen of the Night", "So Emotional," "One Moment in Time," "Saving All My Love," "Run to You," "I Have Nothing," "I Wanna Dance with Somebody" and one of the best-selling singles of all time - "I Will Always Love You." Hailed by The New York Times as "the best musical of this century" and the winner of nine Tony Awards, THE BOOK OF MORMON is the blockbuster Broadway smash from "South Park" creators Trey Parker and Matt Stone, and the Oscar-winning composer of Disney's Frozen and Avenue Q, Bobby Lopez. This outrageous musical comedy follows the misadventures of a mismatched pair of missionaries, sent halfway across the world to spread the Good Word. Now with standing room only productions in London, on Broadway, and across North America, THE BOOK OF MORMON has truly become an international sensation. Contains explicit language. With book, music and lyrics by Lin-Manuel Miranda, direction by Thomas Kail, choreography by Andy Blankenbuehler and musical direction and orchestrations by Alex Lacamoire, HAMILTON is based on Ron Chernow's biography of Founding Father Alexander Hamilton. HAMILTON is the story of America's Founding Father Alexander Hamilton, an immigrant from the West Indies who became George Washington's right-hand man during the Revolutionary War and was the new nation's first Treasury Secretary. Featuring a score that blends hip-hop, jazz, blues, rap, R&B, and Broadway, HAMILTON is the story of America then, as told by America now. Season Ticket Packages are available now at www.HollywoodPantages.com or by phone at 866-755-BWAY (2929) (M-F; 9:30am-5:30pm PT). Current season ticket holders can renew their tickets beginning today. Classic 7-Show Packages start at $236 per person, and are available in five price levels, all of which are located on the Orchestra Level. Group tickets will be available for purchase on Monday, May 9th. Group tickets may be purchased at www.PantagesGroups.com or by calling 866-755-3075 (M-F; 10am-5pm PT). 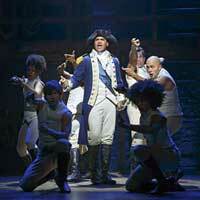 Group and single ticket on sale for HAMILTON will be announced at a later date. Season Ticket Holders lock in the best seats at the best prices, and enjoy benefits such as complimentary ticket exchanges at the box office, lost ticket insurance and 24/7 account access. Season Ticket Holders are also guaranteed first access to added events.